The three tomato plants I have in my garden just keep on giving. I'm not complaining. I wait for my tomato bounty all year long. That's why you'll find a lot of tomato recipes on Just One Donna in the summer. 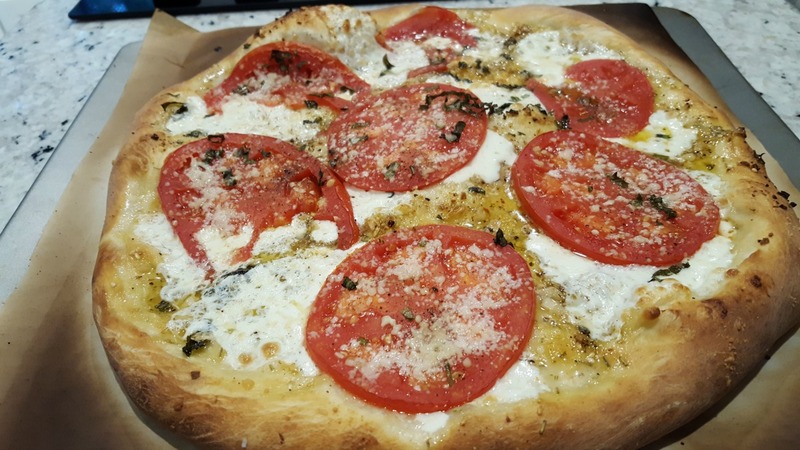 When my garden tomatoes are ready to harvest one of the ways I like to highlight their sweetness is with a pizza. I keep it simple. 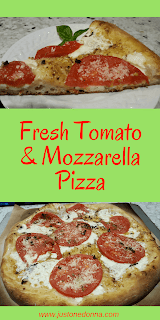 This fresh tomato and mozzarella cheese pizza is a favorite. Pizza became easier to make at home than ordering out when I got a pizza stone. 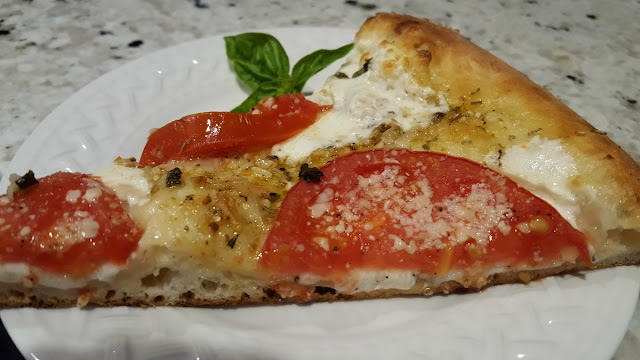 It took me a little while to get the hang of baking pizza with the pizza stone, but once I did my preference for pizza became any kind of pizza I make at home. No more pizza deliveries here. 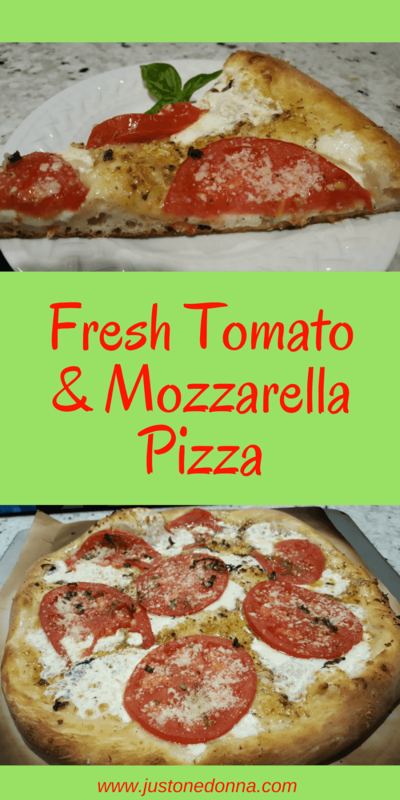 When you choose a pizza stone, choose one that can be used in the oven or on the grill. In my experience, they are less apt to crack. Don't buy one with handles. The handles just get in the way. The key to making pizza at home with a pizza stone is to let the pizza stone get screaming hot. I preheat my oven at 500 degrees F for twenty to thirty minutes before baking the pizza. Any less than that and the result will be disappointing. When the oven is hot enough, the pizza only takes five to eight minutes to bake. The other key to great pizza at home may be specific to my oven. You'll have to test it out. I find that my pizza stone needs to be on the lowest rack of my oven. You don't need a pizza pan. I just place my pizza dough on a piece of parchment paper and lay that right on the pizza stone. Can you ever have too much parchment paper? I love that you can buy it in large quantities now. I use the back side of a sheet pan to transfer the pizza to the pizza stone. Just slide the parchment paper holding the pizza dough onto the sheet pan and then slide it off the sheet pan onto the pizza stone in the oven. It's easy as can be! The only other tool you'll want when making a pizza at home is a good pizza cutter. It isn't an absolute necessity because good old kitchen shears will do the trick, too. I love the speed with which I can cut a pizza using a pizza wheel and I find myself using it for many other things in the kitchen. A pizza cutter is not just a one task tool. I've had this pizza wheel for several years and love it. Preheat your oven to 500 degrees F (if it allows). Heat the extra virgin olive oil in a small frying pan over medium heat until it starts to shimmer. Add the garlic. It should sizzle. Add the Italian seasoning mix. Stir and remove the pan from the stove to cool. You want to infuse the oil with the garlic and herb flavors. Cut a square of parchment paper. Oil your hands with some olive oil. Press the pizza dough into a circle on your parchment paper, approximately 12 inches in diameter. Pour the oil mixture over the dough and brush it across the top of the dough, leaving about a 1/2 inch border. Lay the slices of mozzarella cheese around the pizza in an even pattern. 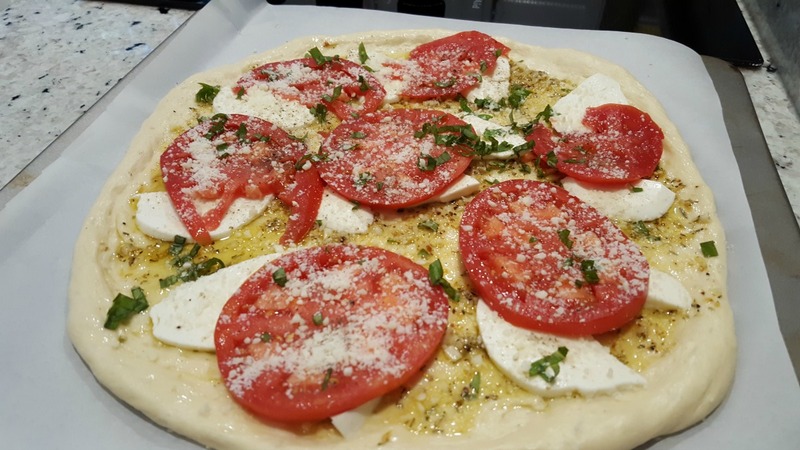 Place the slices of tomato evenly around the pizza. Season the tomatoes with a little salt and pepper. Roll the leaves of basil together and chiffonade into thin ribbons. Sprinkle the basil over the pizza. Now add a generous amount of Parmesan cheese. Transfer the pizza and parchment paper to the preheated pizza stone in your oven. Set your timer for five minutes. Check the bottom of the pizza to see if it has browned. Bake the pizza only until the crust is browned and the toppings look ready. In my oven that takes five to eight minutes. Cut your pizza into portions and serve warm. Are you following my Facebook page? See you there!